Perched over a cliff face, the hooded deck of the Gambier Residence reads like a ship’s prow over Howe Sound, the scenic waters near Vancouver. The facade is clad with beveled siding, stained dark to meld into the forest. The architects designed every gesture of the home as a complement to the landscape, including the slot windows that frame views of the surrounding foliage and the walkway that follows the bedrock of the cliff. 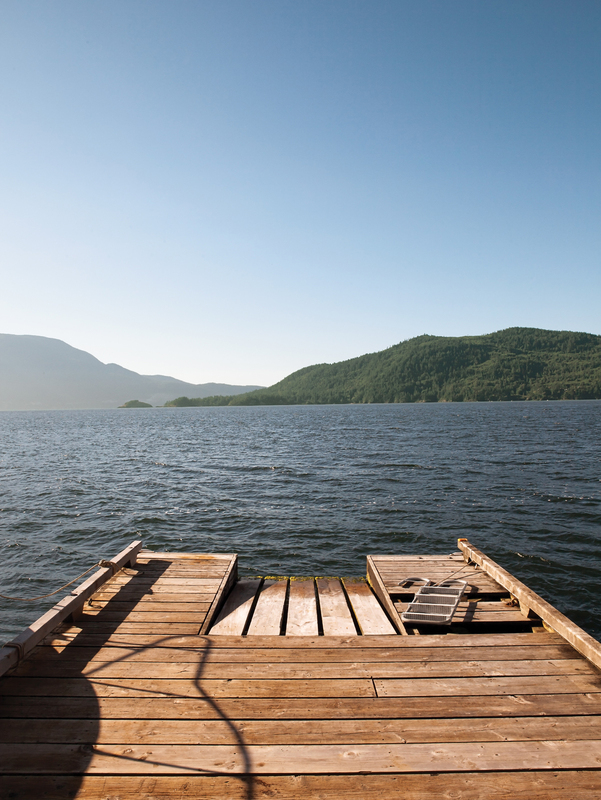 Farther down on the site is a dock whose ramp is lowered by hand via weight-laden pulleys. The residence is accessible by private boat or water taxi only. 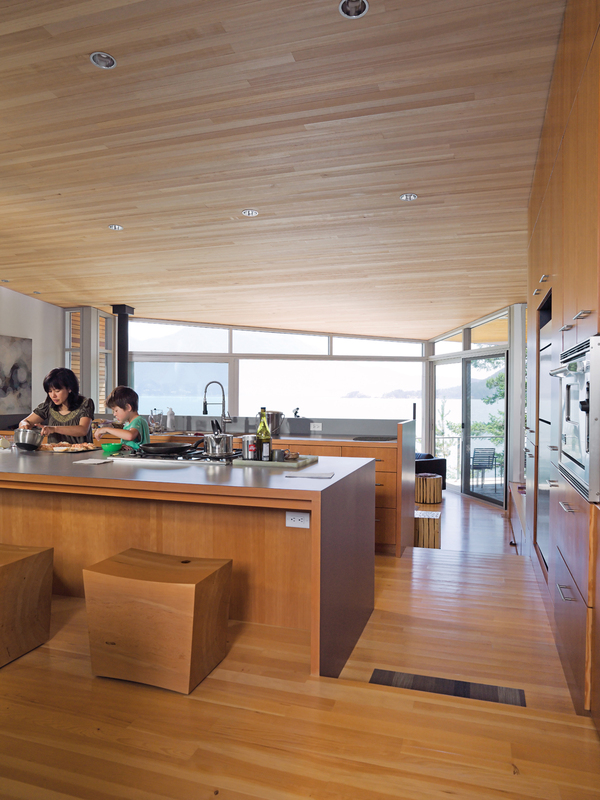 Lam and her son Max prepare a snack together in the open-plan kitchen at the center of the house. The fir floor that covers the living space steps downward twice, creating a grade change that roughly follows the topology of the site. The ceiling is sheathed in untreated hemlock; the custom stools were designed by Brent Comber. The plan of the house revolves around a rocky outcropping lush with life that acts as the home’s central atrium. The granite was left intact in order to serve as the nucleus of the courtyard, and the walls of windows draw a wealth of natural daylight into the back of the building. Down on the cedar dock, the view of nearby Bowen Island generates a dramatic foreground view, while the British Columbia mainland in the distance appears to be a world away. The cantilevered main floor creates space for bracken fern and other indigenous vegetation to flourish. Scattered in the waters between Vancouver Island and the British Columbia mainland, the Gulf Islands have long served as getaways for harried West Coast urbanites. But as more of the world discovers the Canadian isles, standard-issue tourist trappings are cropping up like an invasive species. Gambier Island remains one of the few true getaways. The lushly landscaped and pervasively quiet 25-square-mile sanctuary lies off the main ferry route and is thus out of reach for the usual daytrippers and bus-tour crowd. Yet for those willing to eschew the automobile, it’s less than 30 minutes from West Vancouver by water taxi—and an entire universe away in terms of environment. That remoteness made Gambier Island the ideal haven for Rose Lam and Todd Elyzen, two Vancouver-based film-industry professionals who wanted a weekend retreat for themselves and their two sons, Sam and Max. The couple wasn’t aiming to be self-consciously rustic; they wanted isolation but high comfort—the same kind of furniture, fittings, appliances, and plumbing that they enjoy in their city home. “I said, ‘I’m not going to travel out of the way just to clear out mouse droppings,’” Lam recalls. “The genesis of the house came down to my inability to use an outhouse,” she adds with a laugh. 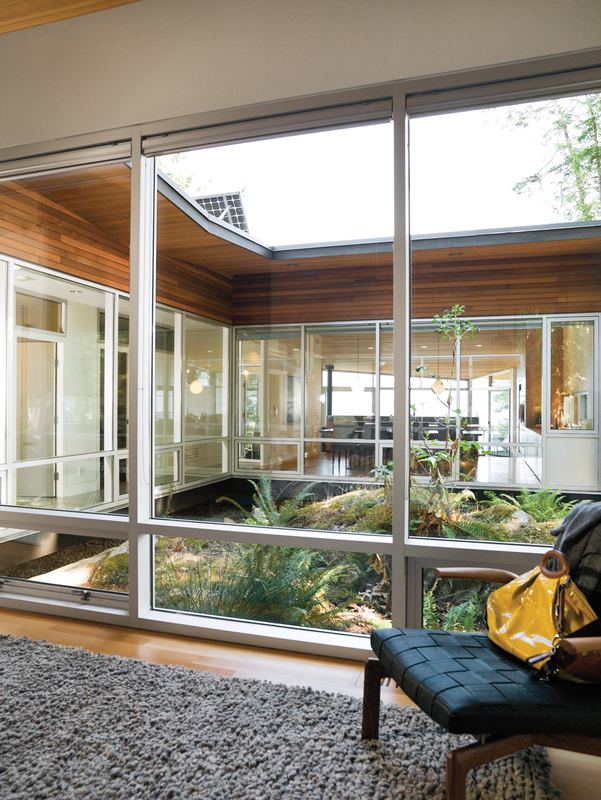 Lam and Elyzen selected Vancouver architects Heather Howat and David Battersby, of BattersbyHowat Architects, for their meticulous attention to siting and the clean-lined aesthetic of their work. 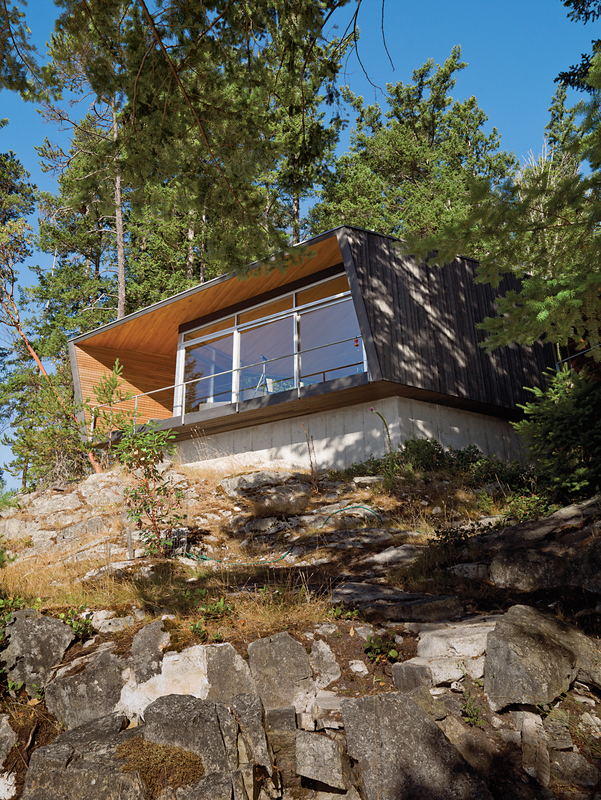 True to form, the architects conceived the Gambier Residence as architecture that would meld with the landscape, emerging out of the foliage and over the waters of Howe Sound “like a shadow in the forest,” as Battersby puts it. Barges loaded with concrete mix, insulation, wood panels, and beams had to arrive at midnight because that was the magic high-tide hour when workers could unload the construction materials at the community dock of the cliff-rimmed island. A helicopter was hired to drop in the structural forms. From the smallest nail to the largest ceiling beam, everything used in the house’s construction had to travel either up the rockface that slopes vertiginously from the cliff to the waterfront or along the unnervingly soft grass road that leads from the community dock. “There’s no possibility of running to the supplier to get an extra bag of nails,” Elyzen says. Elyzen’s experience with film-set mechanics and lighting proved invaluable in figuring out solar panels, septic fields, generators, and other essential off-grid technologies. The main water source is a streamwater-collection system operated communally by two dozen nearby residents. To tap into it, Elyzen rigged a gravity-fed filtration system with two 1,000-gallon storage tanks located beneath the deck. The roof features a rainwater-retention system and a panoply of solar panels, which are strategically positioned at the same angle as the house’s geographic latitude—49 degrees—to maximize the energy capture. The panels produce enough electricity to drive the house during the summer; a generator kicks in during the winter months. BattersbyHowat designed a simple, compact bunker clad in the same dark-stained cedar of the home to house the generator, with Elyzen advising them on how to position the air intake and outtake ports. Once the shell was built (by Hart Tipton Construction, which constructed the main house as well) and the diesel generator was brought in, Elyzen configured an insulating system of alternating foam baffles to minimize noise and reverberation. The power from the generator travels through cables from the bunker to a 48-volt, 750-amp battery bank housed in a mechanical room beneath the house where an inverter converts the voltage from DC to the more user-friendly AC format. Aside from a handful of other cabins, nothing but nature surrounds Lam and Elyzen’s home. Above the main deck, the sloping cedar overhang compresses a spectacular view of Howe Sound, dotted with islands and framed by conifer boughs. Once, dolphins cavorted a mere 100 yards in front of the living-room deck, beckoning the couple’s young sons to the telescope for a closer look.